is there a way to syntax highlight a file I see in Less? But it also want some kind of basic syntax highlighting – at least show the comments differently. Do you know any way to do it? Best of both previous answers: you can invoke system default editor from within less, by pressing v.
Pygmentize comes as a part of the Pygments Python syntax highliter. I think that you should use a text editor. I like vim myself. That will give you LOTS of power when viewing files and then when you want to edit them you will already know the basics. Just to recap, if you will use unix vim is pretty fundamental. I have heard that learning vim is like learning to type. It is the next most useful tool you can learn for programming. As others have said, you can use the power of vim. But importantly, you can do so without learning how to use vi/vim. Vim comes with a less.vim script that works pretty well as a replacement for less, with full color syntax highlighting. It uses less keybindings (just hit 'q' to quit). 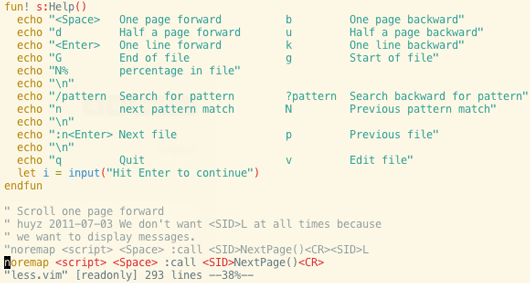 I'm glad to announce a new package, e2ansi, that provides syntax highlighting support for pagers like more and less. The package use the mother of all text editors, Emacs, to perform the actual syntax highlighting. As an added bonus, all other conversions normally performed by Emacs -- like uncompressing files -- is also performed. The package provides a command-line tool e2ansi-cat that starts Emacs in batch mode, opens files, syntax highlight them, and renders the result using ANSI sequences. export "LESSOPEN=||-/usr/local/emacs --batch -Q -l ~/.emacs -l bin/e2ansi-cat %s"
In the configuration above, less restores the original terminal window content whereas more simply output new content after the prompt. Emacs has support for virtually all programming languages and structured text formats. 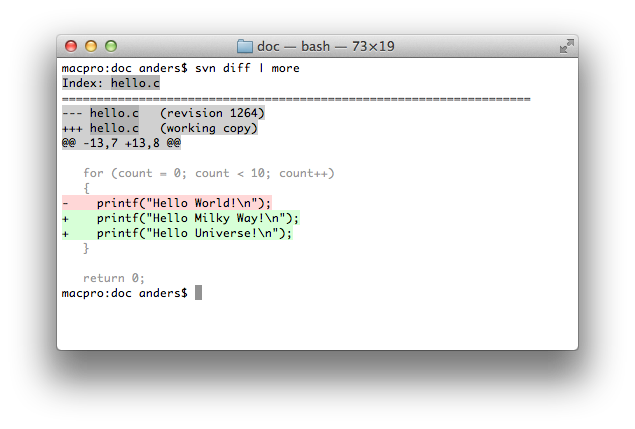 In most cases, the syntax highlighting support is excellent. You can easily add support for more languages and formats, or modify existing packages to suit you needs. 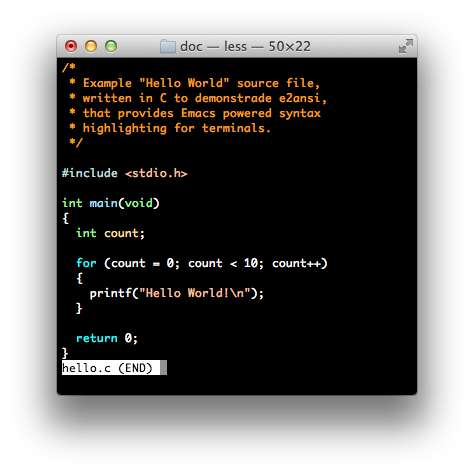 Emacs support color themes. When using e2ansi, the colors in the theme is preserved when viewing a file in less. You can pick a suitable color theme from a number of sources, or design your own. If you use Emacs as your editor of choice, you will get the same highlighting in the editor as you get when viewing a file using less (minus limitations in ANSI sequence format and the terminal window). less will take advantage of Emacs features that perform automatic conversion, for example uncompressing files. In fact, you can teach Emacs to perform any kind of conversion like automatically convert a binary file to human readable form using an external tool. You can view files located on other machines by using Emacs' syntax for remote access like /USER@HOST:FILENAME. On MS Windows, the console does not natively support ANSI sequences. Fortunately, the less application is capable of rendering them. I am not aware of any contemporary binary distribution of less for MS Windows and the provided build files is hard to use. Fortunately, it's easy to build less using CMake, see this text for details. OS X distributes an ancient version of less. Fortunately, it's easy to build a modern version directly from the source. source-highlight has a .sh script located in /usr/share/source-highlight/*.sh. I've created a symbolic link to it with name hcat in /usr/bin. 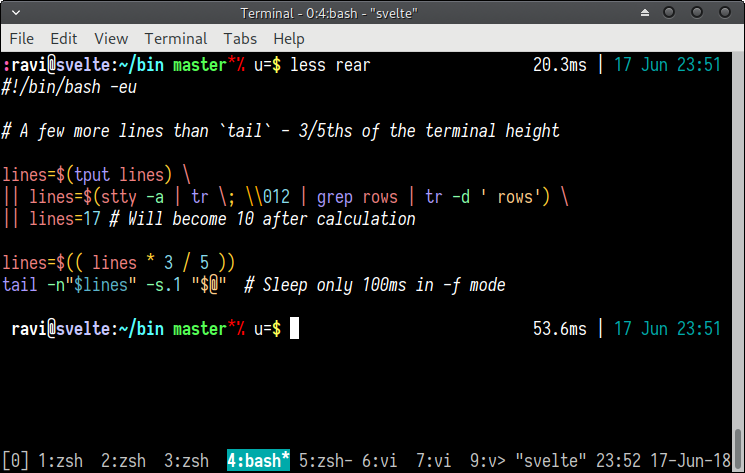 It shows highlighted output in terminal (console) – hcat is highlighted cat. In mac, you can just type view filename, does similar thing like less. #don't like: export LESSOPEN="| /usr/bin/src-hilite-lesspipe.sh %s"
#default:    export LESS=" -R -M --shift 5"
I did not like to replace lesspipe because that has other features. Concatenation did not work. Beware: If your Vim asks you to press Enter when it starts up, you won't see the prompt, but nothing will happen until you press Enter! The cmdheight trick above can help to mitigate that. Here is a script I call highlight-less-wrapper which includes .bashrc instructions on how to setup less to use it automatically. # Only one argument is expected. # less will invoke multiple times given multiple files. die "Cannot open $file for reading"
highlight --force -O truecolor --style aiseered "$1"
Remember to close the terminal and open it again to make sure alias is created. Not the answer you're looking for? Browse other questions tagged syntax-highlighting less or ask your own question. Is it possible in vim to search for a term excluding those appearing in comments/block comments?